August 2010: I spent a few surreal days lighting a controversial C4 dramadoc, produced by Renegade at Aim Image Studios in Camden. 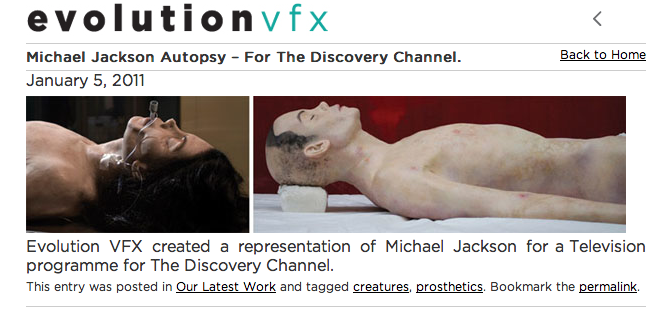 Having flown over a consultant pathologist from Florida, and working with a stunningly realistic prosthetic body made by Evolution Effects, we performed an extremely real-seeming autopsy of Michael Jackson, using his body as a spring board from which to examine his life. Personally I have no idea how this will come across until I see the finished programme but it was a very intense and creative experience and, I’m sure, hard to miss when it comes out later this year. Directed by Lorne Townsend. As you can see OUR worst fears are actually realized the synthetic cadaver looks Exactly like Michael and they did perform an extremely realistic re-enactment using his effigy. This is proof of how abhorrent this program is and we should not let up on collecting signatures or letters. To be forearmed is important regarding the possible decision of DiscoveryUk to rescheduled this abmoniation AFTER Murray’s trial. MJJJusticeproject asks you to write a letter citing the immorality of this program and request a complete cancellation and negation of any future consideration. We have been given the kind permission of Dr.Patrick Treacy to reprint his personal letter to DiscoveryUK as an example of how to write with personal appeal. Please be as civil, courteous and gracious when expressing your own concerns. As a personal friend and previous physician to Michael Jackson for some years, I would like to also add my name to the growing number of people who feel that the special show to air in the UK on January 13th called “Michael Jackson’s Autopsy: What Really Killed Michael Jackson,” is being done for the wrong reasons and transgresses the boundaries of prudence and good taste. Autopsies, either forensic or academic should only be performed for legal or medical purposes, rather than for entertainment. A forensic autopsy should be only performed, as in this case, whenever the cause of death may be a criminal matter and this is the reason you do not intend this production within the US jurisdiction. Your show debases what is accepted decent behaviour within legal and medical practice in western civilisation since possibly two and a half millennia. Forensic autopsies have been performed under established clear regulatory parameters since 150 BC, including that of Julius Caesar in 44BC, which showed the second stab wound was the fatal one. Permission is normally required from next of kin is usually required for autopsy, although in this case you are circumventing this by use of a synthetic cadaver. There is a copy of the official coroner’s report on public record so I don’t presume the viewers will learn anything new from your production. It seems to me that the Discovery Channel is attempting to cash in on the misfortune of mythically famous cultural icon, with no respect either for human decency or the feelings of his children. This entry was posted in Petition Links and Campaigns and tagged DiscoverUK, Evolution Effects, Evolution Fx, immoral, Michael Jackson, MJ, MJJ, MJJP, synthetci cadaver, unethical. Bookmark the permalink.